This training program prepares current and aspiring Agile coaches with processes, practices, mindset and skills to achieve team level agile maturity. One-of-a-kind training focusing on “being agile” and “doing agile” of Agile Coaching. Highly interactive training program that makes ample use of discussions, group activities, and real-life scenarios and challenges to enhance participants’ learning experience. Guiding teams and organizations to simplify their agile journey and achieve true agility. The Agile Coaching Workshop is a classroom training program that is unique and one-of-a-kind training that focuses on both the areas of “being agile” and “doing agile”. This is a highly interactive workshop that makes ample use of discussions and exercises to help participants hone essential coaching kills like self-awareness, coaching stance, mentoring, facilitation, active listening, powerful questioning and coaching for action. The course explores real-world scenarios/situations and challenges, and helps you devise powerful solutions. It will help the learner differentiate between teaching, mentoring, facilitating, consulting, and coaching, and will help him/her gain the skills needed to create a safe environment for meaningful collaboration and healthy conﬂict resolution within an agile team. The various roles, skillsets and disciplines of an Agile coach – coaching, facilitating, mentoring, teaching and how to develop "your style," moving in and out of those roles while remaining ﬂexible, open and confident. The philosophy behind servant leadership and practices and techniques to enable you to become a true servant leader; putting the needs of others first to facilitate the development of high-performance teams. Project, Program, and Portfolio Professionals who aspire to take up the role of an Agile Coach. Skilled coaches who wish to polish their skillsets and learn a few new tricks and techniques. Functional managers or Scrum Masters with some experience as an Agile coach, but when Agile seems like it is not working for your teams. Someone coaching or mentoring Agile teams that get caught in a rut or just going through the motions and not making progress. Knowledge of Agile Manifesto and Agile Methods (Scrum or Kanban or XP) would be very helpful. The class prepares you to act as a “servant leader” on agile teams and leave with ideas for helping them as soon as you get back to your work environment. Understand and utilize the key skill areas and knowledge areas applied by the best agile coaches. Clearly ascertain the distinction between coaching and mentoring and know when to apply each of these most successfully in any given situation. Understand how to address the dysfunctional approaches to conﬂict that teams often develop. See the broader organizational context more clearly and determine the best interventions, and best actions to create a positive impact. You’ll have many new things to try with your teams and you will probably depart with a few provocative ideas to chew on or to wrangle with for a while. All of these outcomes add up to your ability to become the excellent agile coach your teams and organization needs. 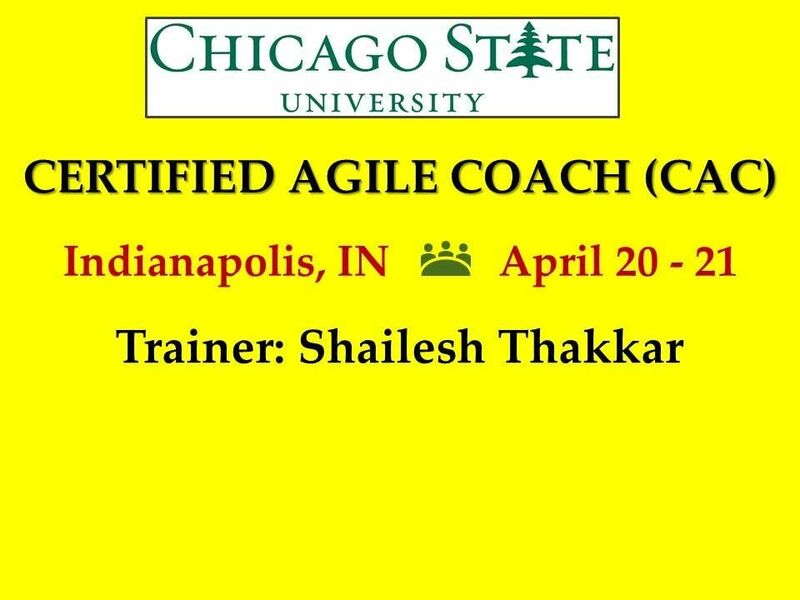 Workshop participants who successfully complete this live online training workshop will be awarded the Certified Agile Coach (CAC) from the Chicago State University (CSU). 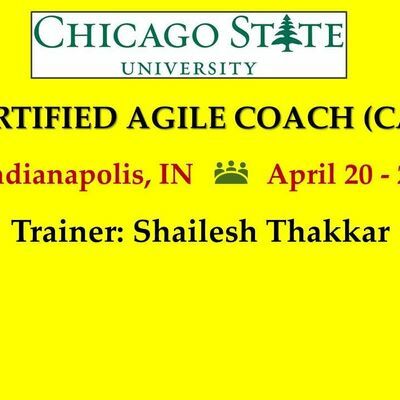 Workshop participants who successfully complete this live online training workshop will be awarded the Badge of Certified Agile Coach (CAC) from the Chicago State University (CSU). Please email to: aW5mbyB8IGFnaWxpdHk0YWxsICEgY29t or contact at (800) 417 - 4940 to learn more about this training.